Golfer’s Elbow – A Possible Solution? 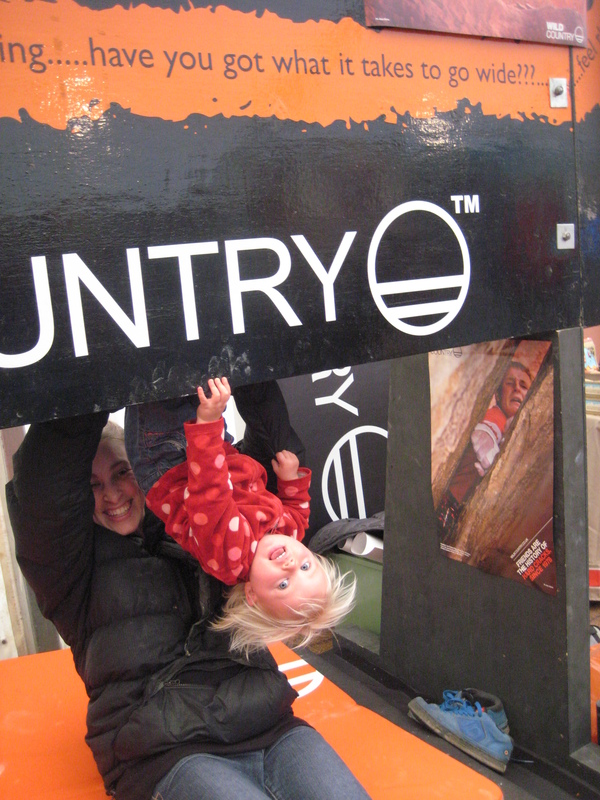 Around 2004 I started to climb indoors a lot – as in 4 times a week or more. As you might expect, my grades started to creep upwards but at the very same time I developed a nasty case of Golfer’s Elbow. That deep pain on the inner side of your elbow (the fancy word being medial epicondylitis) which only seems to get deeper and more excruciating the more you lock-off or do pull-ups. Know the feeling? 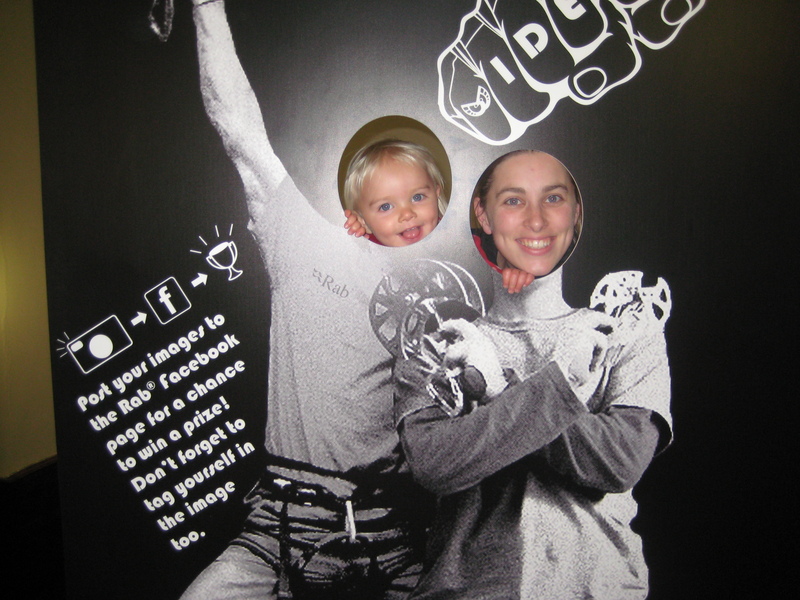 Like many other climbers I sought the advice of the internet and a series of physios. I tried the usual methods; rest, ice, hot-cold treatment, massage, anti-inflammatory medicine, postural correcting exercises and lots of antagonist work. I must have spent a good £1000 or so seeing different people, buying books and feeding my growing Ibuprofen habit. Unfortunately though, nothing seemed to hit the spot. Every person I asked recommended some kind of combination of the above, but I started to get frustrated as the pain continued to get worse. Eventually I made the hard decision to take some time out from climbing and training as I knew no other solution. Just as I’d made this decision I coincidentally got talking to one of the GB Senior Team members called Drew Haigh (I was managing the team at the time) about my plight and he showed me an exercise a yoga teacher had showed him for Golfer’s Elbow. Drew sounded really convinced about this “magical stretch” that he had been taught, but I remained sceptical as nothing had worked until this point. I got the beta off Drew at a training session and guess what………. 2 weeks later my Golfer’s Elbow had totally disappeared! I couldn’t believe it. Two years of pain had been removed in 2 weeks. I have no idea what this exercise is called, but hopefully with the aid of the following photos and a little description some people out there may benefit in the same way as I did. I’ve shown this stretch to a number of people I’ve coached over the years and it has to be said that it’s not always successful – it’s seems to work best when none of the conventional approaches (physio, antagonists, NSAIDS) work. Give it a try though – you’ll only have wasted a few minutes if it doesn’t work. 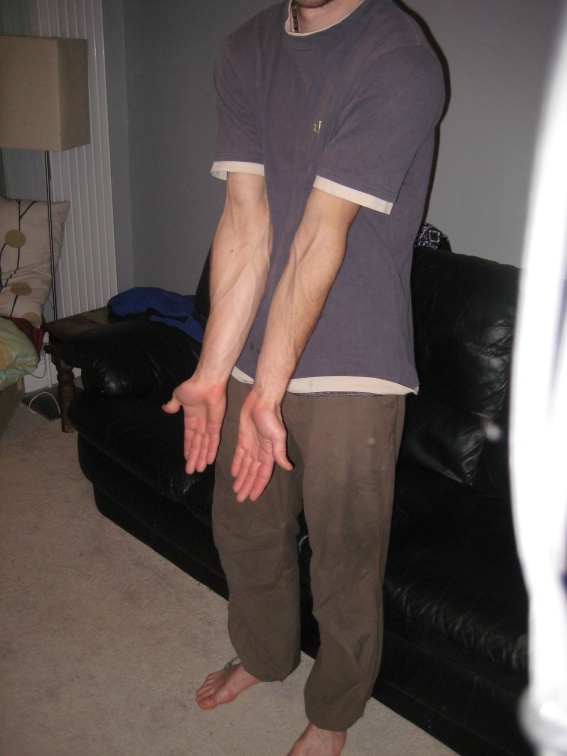 The start pose – the position that you’re aiming to hold with your arms is that shown in the picture below. You want your palms facing outwards and for your elbows to almost touch in the middle – it feels quite awkward to hold this position. You should note that in the correct position your elbows should be about the height of your belly-button and inside the line of your body i.e. arms not lying down the side of your body. Got that so far? The finish pose – ok, so with that in mind, you now have to perform that same arm positioning, but on the ground lying on your front! This means that you’ll be lying on top of your arms and your bodyweight is forcing your arms and elbows into a nice straight/open position. 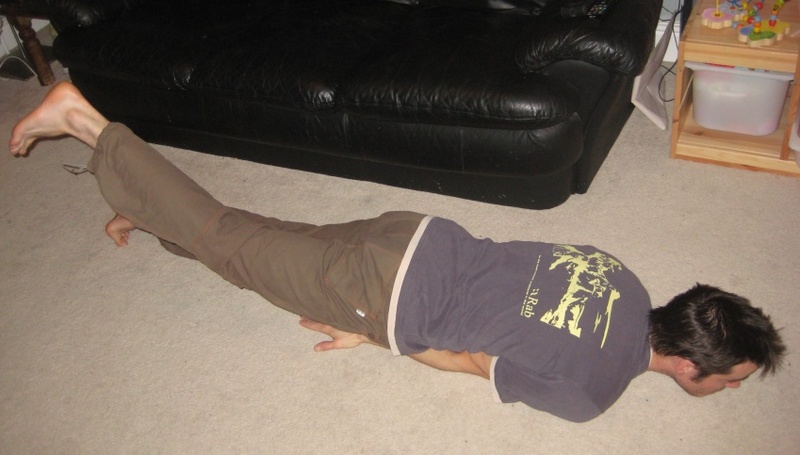 Note that it’s really important that you do this exercise on a solid floor (not soft matting) as you don’t want to be able to hyper-extend your elbows. 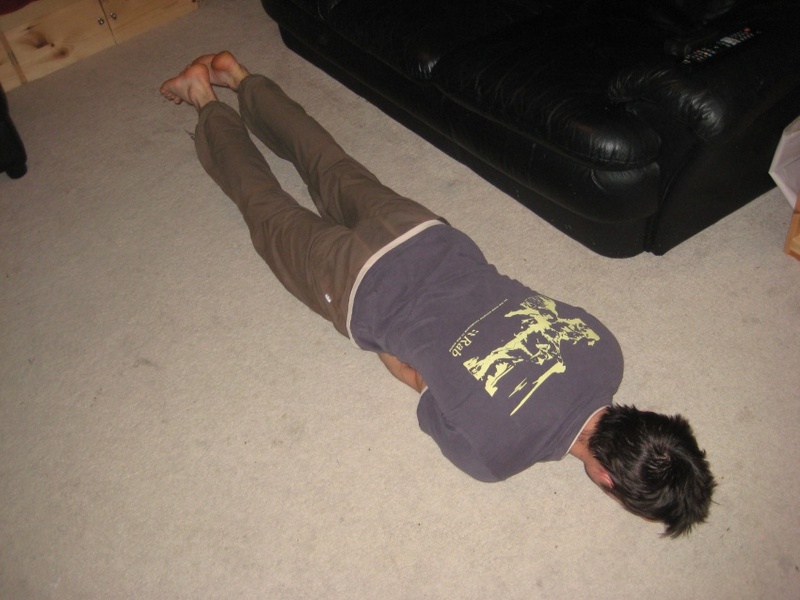 In this position you should feel a nice stretch – if it feels painful, then stop! I find looking straight at the ground in front of me or to one side is most comfortable with the neck. The movements – once you’ve gained confidence with the initial positioning and you’re happy that there’s no undue pain, then you can try raising one leg at a time (I do reps of 10) which results in the front of your hip bone pushing into the back of your forearm giving extra stretch. The leg needs to be raised out 10inches or so off the ground and I do just 10 reps on each leg. Once done, I get up off the floor shake my arms out, and get back to whatever I was doing 2 minutes earlier! 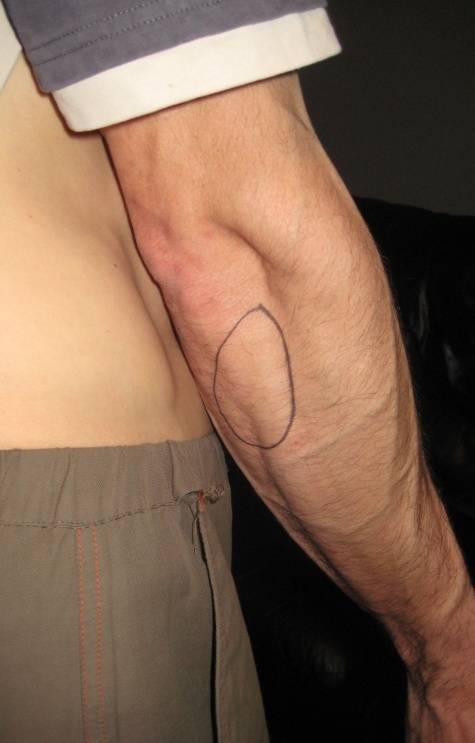 Below is a quick shot of the back of the forearm to show you the point at which it makes contact with the front of your hip bone once you’re lying on top of your arms. If this helps one person, then it’s all worth it! Please do pass on the information if you find it useful and I only came across it by word of mouth from Drew. I owe you big time Drew! 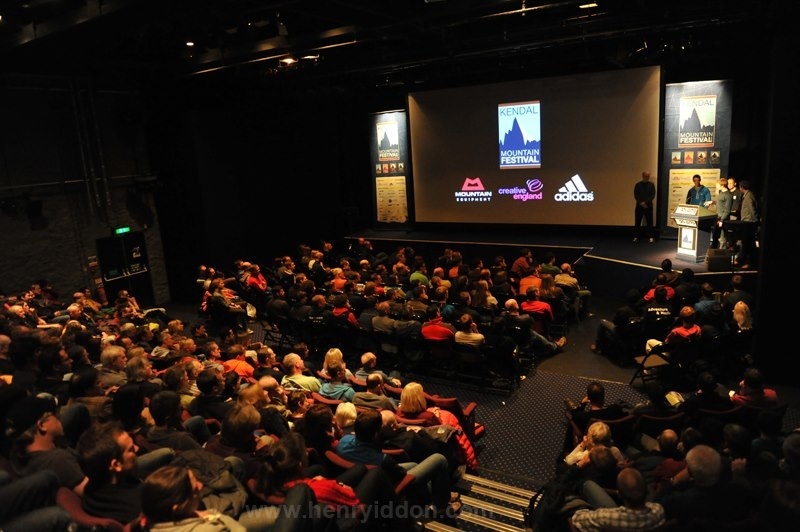 Last weekend, was one of the big ones in the outdoor events calendar – The Kendal Film Fest! This year for me was a big one, as the film – “Wide Boyz” – that Pete Whittaker and I made with Hotaches out in the US last year was going to finally premiere. It feels like it’s been ages since I climbed an offwidth, but last weekend was like a strange dip back in a very weird past. I headed up to Kendal on Friday for the premiere with my wife and daughter, quite excited that they were both going to see what I’d actually got up to in America. It’s always been the case that they’ve know what I did each day, but never saw any footage. I think the knowledge that my family was there (as well as the general public) to pass general opinion on the film made me nervous for the first time in absolutely ages. It felt like being a teenager at school with my first bit of public speaking, except this time there were hundreds of people to see if I cocked up! All my nerves disappeared though, when after 10 seconds into the film playing (where there is shot of me on screen) my daughter Hannah screamed out “Daddy! !” in the cinema and everyone laughed! Watching the whole film in its final form was a really cool experience and despite the fact that I was there when it was all filmed, the tension still got to me. I guess that’s the art of a good film maker?! Photo: Hannah starting to learn bad habits from Dad. On the Saturday, it was lots of Q&A sessions after the film viewings and it was good to get some really interesting questions from people and also still hear what things people couldn’t get their heads round e.g. is it easier to run it out or step round Friend 6’s?! Physical vs. Mental. In the afternoon Pete and I headed off to the town hall for our lecture, which despite being in front of 350+ people didn’t seem half as scary as the premiere. Yet again at the lecture the question of “how do you clean a roof crack” came up – it’s starting to make me wonder if this is a common problem out there! Outside of the lecture hall Rab had made a funny “Tom and Pete cutout” that we had some fun on – although I couldn’t really use it as my head is such a terrible pin-shape that it doesn’t fit in the hole. Probably the reason why I look a bit of a mushroom head in a helmet…. Photo: Kim and Hannah show me how it’s done. As I pointed out to many people on the weekend, much of the adventure and trip that Pete and I had out in the States, has to be owed to the generousity of Wild Country, Rab (Patagonia for Pete) that helped fund it. Having a bit of wild faith in two British wide boy punters who could have totally fallen flat on their faces, has to be recognised a form of true altruism.